Housing market reports, news, statistics, and opinions are brought to you by Paula Smith Associate Broker RealtyPath St George. You will find all market condition reports for Southern Utah and the St George real estate forecast. If you would like to have Paula Smith cover particular topics, related to the Southern Utah real estate market, please use the contact information at the top or bottom of this page. Please note, all topics are written by Paula Smith and everything is the intellectual property and opinion of Paula Smith. Welcome Spring! I apologize for being so behind in releasing this market report; it’s been busy out there for me so I’m just as curious as some of my readers may be as to the current market conditions in St George. Those of you who receive my monthly (mailed) newsletter, allow me to further extend my apologies for that is late as well. The April newsletter was sent to the printer today, and it should be ready to mail next week. Here is my “go to” info-graphic. I feel this shows the most amount of pertinent information. The graph below shows a 2-year glimpse, for the Greater St George area, residential homes. We are in the middle of the 2019 St George Utah Parade of Homes, which means the area is buzzing! Approximately 30,000 people make their way to the annual Parade of Homes. It’s busy for all things St George, especially the housing market. Sales always surge this time of the year, so as of this report, it won't be including most of February, that report will be ready in a couple of weeks. It’s interesting to note, home sales for the past three months have been on the decline. A decline such as this is not entirely unusual….UNLESS…February and March underperform. Here is a look at the past couple of years, this shows similar trends in the months leading up to February and then an apparent surge for February and March, and into the summer season (I’m following the “black” line on here for the “sold” homes). The number of “active homes” is also following similar patterns, and I’d expect that to shoot up on the next report as well. It should be a key indicator, assuming we follow similar trends, then I’d expect the market to continue as is. Are prices still moving up? Pricing is a question I’ve been asked about weekly. 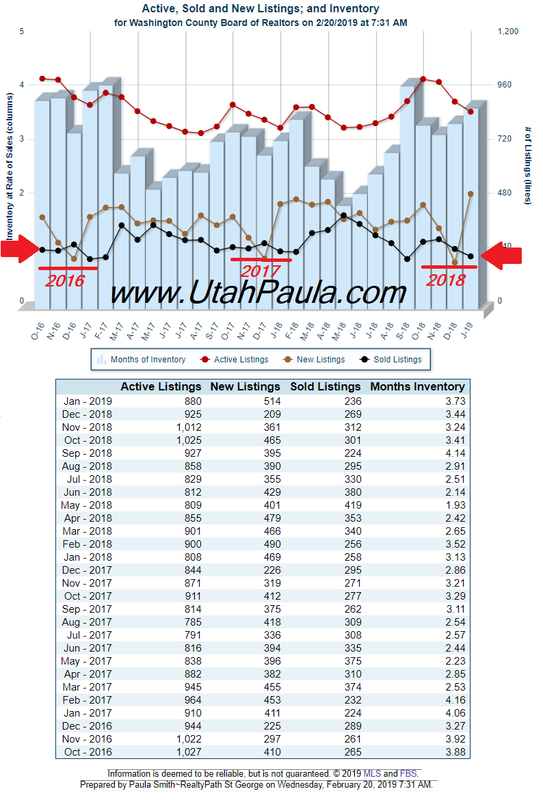 Here is an interesting report, this is taking into account Jan 1, 2018, to Feb 10, 2018 and comparing it to the same time this year (I used these dates to keep the Parade of Homes out the mix since we are still in the middle of that as of this post—using these dates will skew the numbers). I am using ONLY the Greater St George area (not Hurricane). The number of SOLD homes for this time is down this year, 14%. The average sale price for this time is almost identical. It will take a little more time and comparison to determine how we are holding, specifically due to the patterns in the market for this time of year, but next month will be exciting. Next month I'll also take a closer look at SunRiver and let you know how the market is playing out there. Stay tuned! My Newsletters are out! Are you on the list? If you'd like to be included, send me an email with your mailing address and I'll include you (they are mailed out once a month). Do you have other statistics or information you'd like to read? let me know. I am Paula Smith, Associate Broker with RealtyPath of St George. I have been a licensed, full time, real estate agent in Southern Utah since 2006. 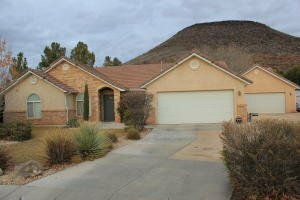 I have been selling residential real estate during all of the changes in the market as well as witnessing our St George area grow to become one of the fastest growing cities in America. I keep my finger on the pulse and not only pay attention to what is going on, but I've also been able to accurately predict what's to come. Allow me to be of assistance and earn your business. 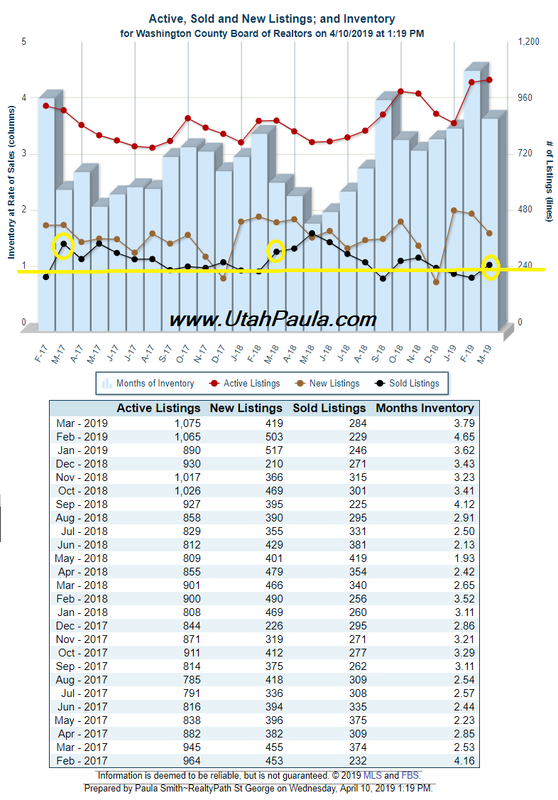 If you’ve got a home in Southern Utah that you’re thinking of selling and you’d like a property market report, I can send that to you. If you're ready to buy or sell, I'm ready to make it happen. This home SOLD--in 24 hours! "Hi, I’d like to relocate to the Southern Utah area and I’m looking for a home around 1800sqft with a larger lot, something not so close to neighbors, and I’d like an open floor plan, single level, something newer, space to park an RV would be nice and a VIEW…I really want a view of the mountains Utah is known for. …Oh…and my price point is under $340,000." I can’t tell you how many calls like this I receive per month (a lot!). Typically, my response is: “you can achieve most of these things, but probably not with a view”. This 4-bedroom 2 bath home has it ALL! It was built in 2012, this home is new already…but the current owners have added some amazing upgrades (completed only a few months ago). 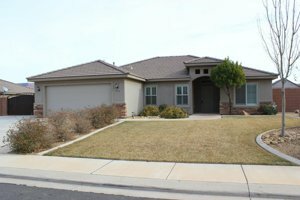 The recent upgrades include: beautiful wood-look tile floors, granite in the bathrooms (and kitchen), a new master tile surround and tile work around the separate tub, new carpet, new appliances, full landscaping, and a large RV decorative iron gate. The yard is spacious, plenty of room for a pool if you wanted one and there will be room left to enjoy the garden, RV parking, and there is even a shed for additional storage. The homes located behind this home are situated lower on their lot, allowing this home to achieve a wide-open feeling and allowing the spectacular panoramic views of the mountains. Sales are down for December. Is there a crisis looming? Are we headed for a 2007 housing market nosedive? No, I don’t believe so. 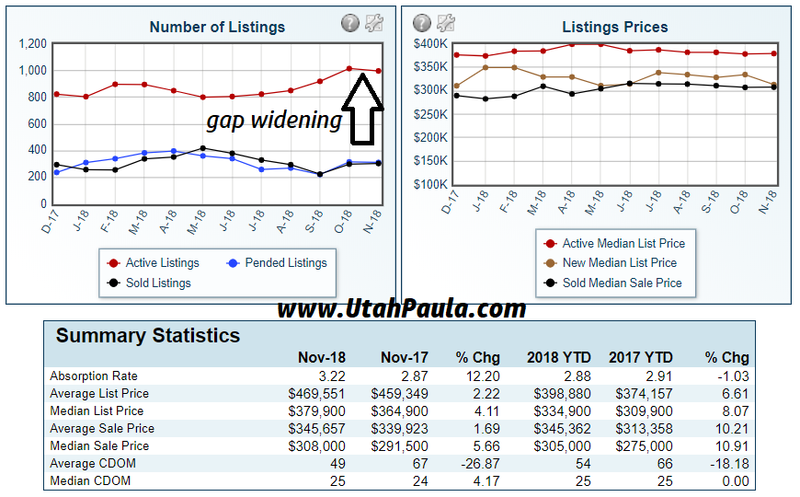 Home sales in St George are lower and this is typical for December sales, it is, however, lower compared to the prior December months for 2016 and 2017. The graph below shows 257 homes sold in greater St George for December. Compare this to 2017 having 295 and with 2016 having 289 homes sold—that’s about an 11% decrease in sales for December 2018. Historically, January is even slower than December. Still, I do not believe this to be any reason for concern. I do believe our market it is shifting, but I personally do not fear this shift. I believe we are going from an insane market to a more “normal” market. Normal isn’t a reason for concern, I’ve been more concerned with the market we’ve been experiencing. It’s the abnormal and anomalies that are real reasons for concern. Normal is a little boring for you “fly by the seat of your pants” and “hope like heck we don’t lose our shorts” kind of investors…. but who wants that kind of investment? The housing market is among the safest bets and long-term investments you can make, so in that respect…. normal is awesome. I welcome "normal". Sellers who jumped on the caboose of this fast moving housing train, who are pricing homes at top dollar (and who are being the most stubborn) are likely to be the sellers that will yield the least return. Why? Now is NOT the time to be overpricing your home in St George Utah. We are heading into the Parade of Homes (in February) so any seller who has been thinking of listing their home, will likely do so in the next 30 days. Builders are finishing up their new construction spec homes like Hershey Kisses on a production line. Your competition is about to be insane and keep in mind while sales DO increase in February (during the Parade) your overpriced home is going to be tossed into the listing abyss because there are too many other homes to see that are well priced and ready. Buyers don’t have the patience to sift through overpriced homes that may be inclined to reduce if they make a reasonable offer (especially when there are many other choices). December arrived seemingly unannounced. Is it just me or did another year slip by at record speed? I’ve been heavily involved in organizing my business, so I’ve been reaching out to many of my website users to determine if you’d still like to be on the mailing list. I’m hoping to reach out to buyers and sellers I’ve allowed to slip through the cracks, or those who weren’t ready a few years back, maybe now you’re ready? I’m also starting a direct mail newsletter, it will automatically go out to all of my past and current clients, but if you’d have an interest in receiving that, simply reply to this email and send me your mailing address. Clients…watch your mailbox and let me know if you do not receive the newsletter in January. Are you planning a trip to St George Utah? St. George is a great place to visit with many new restaurants and great activities for the whole family. Selecting a hotel isn't always easy, especially when trying to find one to fit all of your needs. Even more difficult, is finding a hotel that allows the family dog to come along. St George pet-friendly hotels aren't as readily available. 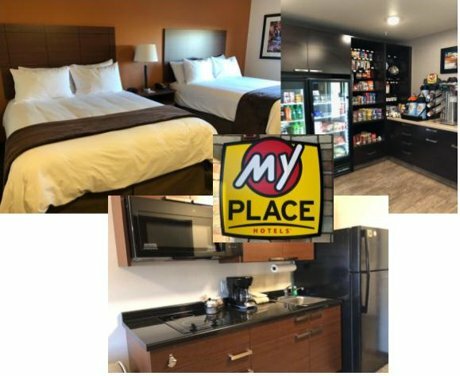 Finding a pet-friendly hotel just got a whole lot easier, the new hotel chain "My Place Hotel" is the perfect place and has a lot to offer. 2018 has been an incredibly difficult year. No, not for real estate. 2018 has been difficult for me, personally. Probably the most challenging year that I can recall in my 40 (something) years. January set the tone for a seemingly dark year. In January, I received a text from my husband (after inquiring how his day was going). “Not good, I don’t think Mike is going to make it”. He was right. Mike was a young, amazing soul on the earth. He was my husband’s co-worker, friend, and a former client of mine. He was involved in a horrific accident doing a job my husband still performs, and tragically Mike lost his life. 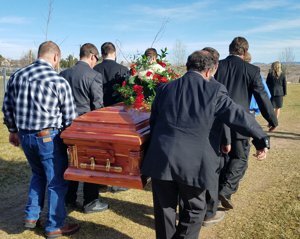 My husband suffered a lot that day, a lot of people did.